The Craghead retrofit project has delivered energy efficiency improvements across a whole community, demonstrating how retrofit can be delivered at scale. To meet our climate change ambitions, the UK must start retrofitting housing on a very large scale indeed. 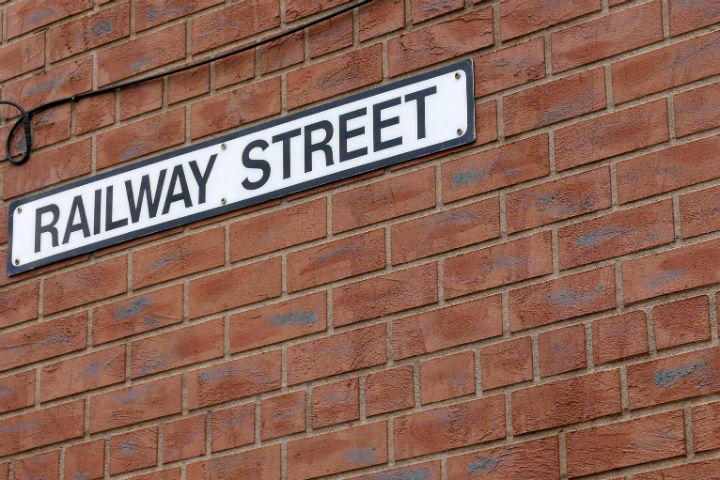 The complexity of retrofit work, coupled with its cost, means that carrying out projects whole streets at a time is likely to be the most efficient and effective way to tackle the challenge. 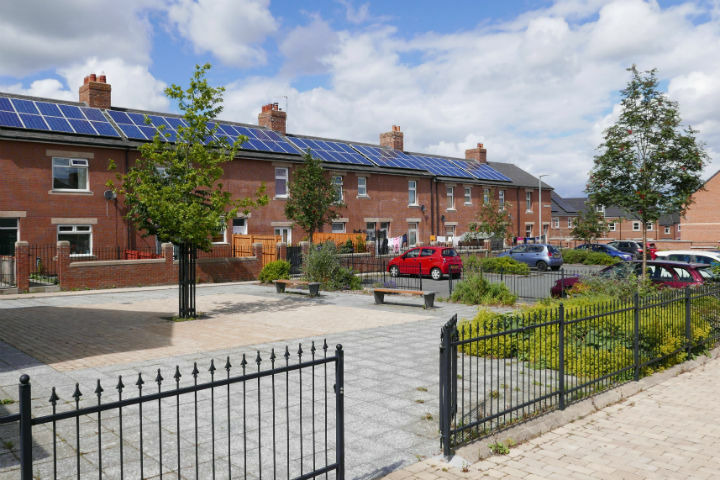 In the third of our articles on retrofit, we look at how one scheme has installed energy efficiency measures across a whole community. Craghead village, near Stanley, was built to serve the coal mines that dominated County Durham for over a century. The closure of the local pit in late 1960s led to a familiar story of deterioration as the village settled into economic and social decline. 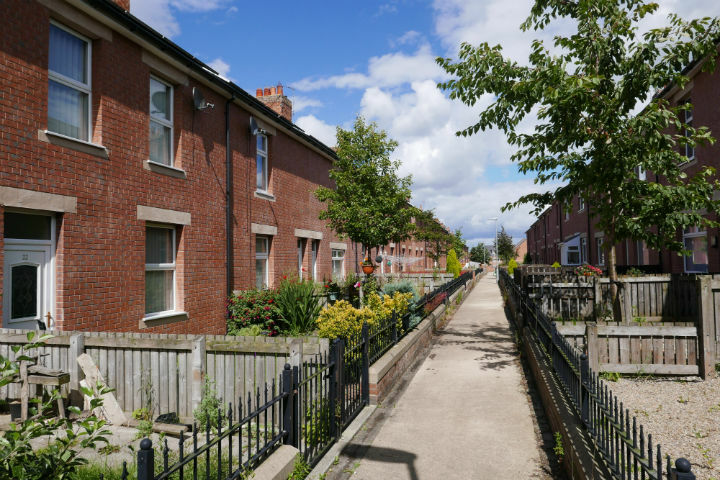 As part of its Green Corridor Neighbourhood Masterplan, Durham County Council, alongside their consultant Fairhurst, commenced a programme of environmental improvements to a substantial part of the village. Last month I met up with Adrian Cantle-Jones, the council’s Housing Project Manager, to see what they’ve achieved since 2008. Some of the dwellings, still heated with coal fires, had EPC ratings of G. The EPC rating classification doesn’t go any lower than that.Walking around the neat and tidy streets of Craghead, it’s hard to imagine what the village was like before the retrofit project took place. Adrian painted a picture for me of unemployment and housing market failure which had given rise to poorly maintained houses and many living in fuel poverty. The ubiquitous Victorian red brick terraces all had solid uninsulated walls and some of the dwellings, still heated with coal fires, had Energy Performance Certificate (EPC) ratings of G. The EPC rating classification doesn’t go any lower than that. The project took a two pronged approach. Firstly, a programme of public realm improvements saw the worst of the properties demolished to create pocket parks and car parking areas. Boundary walls were dismantled and rebuilt, roads and pavements were resurfaced, and new trees were planted. 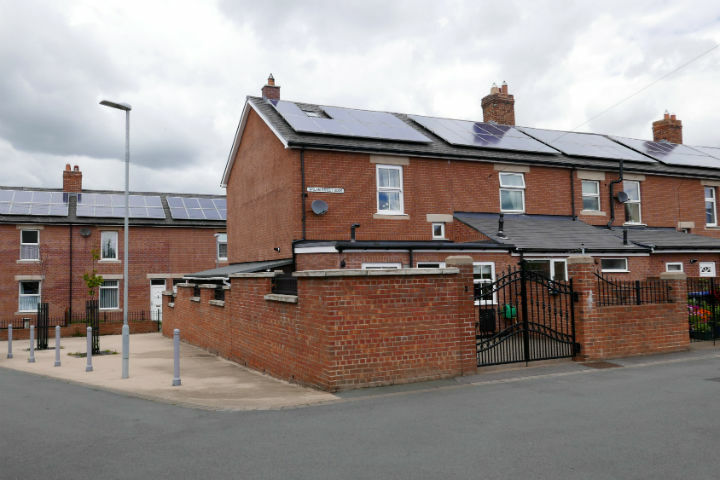 Secondly, over 200 of the houses were retrofitted with external wall insulation, loft insulation, double-glazing and most had PV panels fitted to the roofs. The external wall insulation (EWI) was one of the most complex elements to plan. Adrian explained how they persuaded Northern Powergrid to move all of the overhead power cables underground which made scaffolding simpler and avoided having to relocate all of the surface mounted cables. All of the roofs were extended at the eaves and gables to cover the EWI which was about 100mm thick. Drainage pipes had to remain externally, but these were replaced from ground level upwards to suit the new wall profile. The brick finish to the EWI is blended to match the buildings in the area. The system used was the Alumasc Rendabrick system which uses two different coloured layers of polymer cement render over rigid insulation. The base coat is grey to look like mortar, and the topcoat is red to match the brick which is cut back to create the brick pattern. The surface was then hand tinted to match the brickwork used in the new boundary walls, and the coursing reflects the bond used on the houses originally. This is one of the best examples of brickwork EWI I’ve seen without using true brick slips. The look of the end product was key to ensuring the community bought into the project. All of the houses are in private ownership and owners were asked to contribute 25% of the retrofit cost. A full time clerk of works was based in a ‘show-home’ to demonstrate to residents how the project would be carried out and to give advice on energy efficiency measures. The consultation process was so successful that only one out of the 200 owners didn’t sign up. Residents have already benefitted from lower energy bills and increased property values. The project has probably added another 25 years to the lifespan of these terraces. The challenge of financing the project was even more complex than the retrofit work itself. Adrian explains how he navigated the maze of funding opportunities from local and national authorities, energy providers, local partnerships and charities. Part of the problem was that grants regimes kept changing or closing, and sadly he’s certain that a project like this couldn’t be done now. The results of the Craghead retrofit project are clear. Over 200 homes across 6 streets have been retrofitted, bring energy savings for residents of 25%, and bringing all properties up to an EPC rating of C (SAP score of 65). 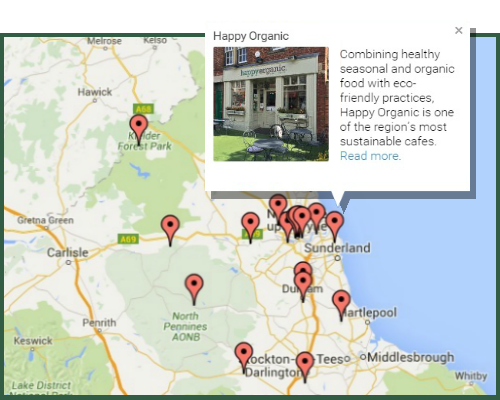 It’s demonstrated that retrofit projects can be carried out at scale with careful planning and with the support of the community. When the government finally recognises that housing retrofit must become a national infrastructure priority, as championed by the UK Green Building Council, then ambitious projects like this can become commonplace. 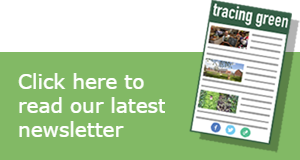 Read more articles on Retrofit on Tracing Green here. Good question! Perhaps it’s conservative, but so many variables!